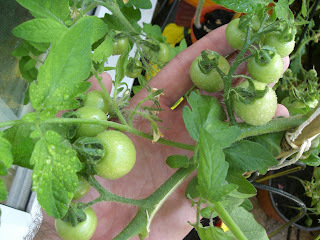 Yes my normal experience is outdoor tomatoes normally start ripening in August, although I was pleasantly surprised to get a very small harvest off of two of my cherry tomato plants last week but like you, now its a waiting game to see when the next will be ready. You haven't done anything wrong, just keep doing what you have been doing, that is feeding and keeping them watered. Some people chose to hang over ripe banana skins/ bananas next to the plants to speed up the ripening process but I think this is most effective in a closed greenhouse environment (but a sheltered balcony might also be suitable for this method). Personally if I wanted artificially ripened produced I wouldn't grow my own, iykwim. My experience is exactly the same as Kella. 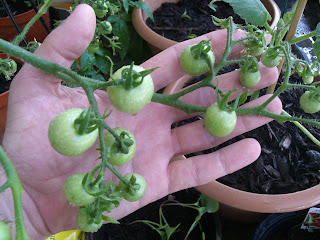 As you know I went mad and planted 20 varieties and the only ones that are ripening at the moment are the tumbling ones. Last year I would say that it was well into August when the majority ripen and then it is in abundance. It is a question of patience. Don't despair Callum - a few of my outside cherry toms are showing signs of a little orange tinge but my Roma inside and out are very very green. Last year it was easily August until I got a good red crop ( I will check on my blog) but then we got the blight anyway so had to burn the lot! I'm in the same boat,this is the first time i've tried growing tomatoes.I over compensated with the seeds at the beginning but i gave away so many plants.What I have now are plenty of green tomatoes.I'm glad to hear from the other comments that its simply a waiting game now.I'm looking forward to that day! Well, after all of this feedback and conversations with friends, it seems the entire UK population is full of green tomatoes, so I'm definitely not alone! I have noticed stages of growth recently - fast-forming trusses, now the fruits are all swelling to the same size, so I presume it'll only be a short time longer now until they start ripening. Tragically, I dreamt last night that they had started ripening - think I may be becoming too obsessional about me tomatoes!